Being a woman in a leadership role has its unique challenges and concerns. This program addresses these issues and helps prepare you for leadership positions. Learn to become a leader that others will want to follow. By first developing yourself as a leader, you can take on the most challenging leadership responsibilities: establishing and executing your strategic vision, executing against vision and harnessing your most competitive advantage -your team. Executive leaders need to handle high levels of ongoing responsibility for people, resources, and results. The stakes are high, but so is the satisfaction and pride that come from serving people, helping them succeed, and adding significant value. Learn to become a leader others will want to follow. By first developing yourself as a leader, you can take on the most challenging leadership responsibilities: establishing and executing your strategic vision, executing against that vision, and harnessing your most powerful competitive advantage, your people. The rapid pace of today's business world means that the best leaders are the ones who keep growing. The Chambers' Free Executive Training Certificate Course, will immerse you in cutting­edge thinking from a local and global perspective. You'll return to your organization reenergized and ready to inspire growth at all levels. We will take you on an intellectual journey that is both stimulating and practical. Each Executive Education program allows participants to interact and exchange ideas and critique each other. Our presentations are by video, audio and webinar by seasoned practitioners and business owners. Managers, supervisors, team leaders and others with leadership responsibilities or individuals who are interested in understanding and improving their personal leadership skills and effectiveness. When you look and act like a successful leader - when you've got executive presence - people take notice. That it-quality sends a signal to others that you're confident and composed. It also conveys to those around you that you are in charge. We'll start with a discussion on what exactly executive presence is and why it's important to your career. We'll also share some ideas on how to build and sustain your presence. Most people are afraid of speaking in public, but effective oral communication is a key skill in business. We will provide simple communication tools, strategies, and tips that are easy to use and produce immediate results. We'll help you sound more confident, use body and language to better express ideas, and overcome anxiety. Self-confidence is a key ingredient in any successful career; in fact, in life in general. It's that belief in self that allows you to envision mastering skills. It allows you to envision accomplishing interesting and challenging goals. When you have strong self-confidence, others know it. In fact, they can feel it. And it makes them want to include you more. The reverse is also true. If you lack self-confidence, the average person can sense that. And when they do, it makes them question you. Can you anticipate the needs of others before they even ask you for something? How well can you predict what's going to happen in your industry over the next five years? Your answer to these questions indicate how well you're thinking like a leader, which can significantly impact your career advancement. Develop your strategic leadership by studying and making insightful connections between your company, your market, and your customer. Many issues you've never really thought about before. I mean, how do you rally maximize what your team is capable of. Good news! Fine tuning a team is a skill you can learn. With a little patience and a lot of effort you can learn to master these skills so that you're always building effective teams. Learn to motivate, communicate with, and manage a team. Bonus presentation: Leaders Rise to the Occasion! FREE to Chamber Members, $75.00 for Non-members. 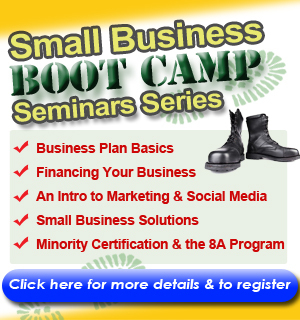 It is recommended that you complete our Small Business Boot Camp.